On Monday, February 25th, the International Court of Justice near-unanimously ruled that the British occupation of the Chagos Islands is illegal. Though it was only an advisory ruling, the ICJ’s decision carries enormous moral weight and is a significant blow to the UK’s international prestige. Under colonial rule, the Chagos Islands were part of the greater colony of Mauritius, under the same British administration. However, when the decolonization process began, American interest accrued in establishing a military base on the island of Diego Garcia. British control created an easy path to establishing such a base, and so the British singled out the Chagos Islands and detached them from Mauritius so that they could retain ownership of the islands despite decolonization. The UK’s unwillingness to cede the Chagos Islands and allusion to security concerns point to the archipelago’s strategic convenience for the US. Carl Schuster, a former director of operations at the US Pacific Command’s Joint Intelligence Center, acknowledged that the Diego Garcia base was “very important to US operations in the Persian Gulf and Indian Ocean” and that its loss would force the US make major changes to logistics support in the region. Perhaps not in-coincidentally, the only dissenting voice among the ICJ judges was Joan Donoghue’s, the American judge. In fact, Diego Garcia is the US’s largest military base outside of its own borders. Its location only 600 kilometres from the coast of the Indian subcontinent is highly strategic and makes it a convenient launch site. It also played an important role during the Iraq and Afghanistan conflicts, acting as a “launch pad for long-range bombers.” The CIA is also suspected to have used Diego Garcia as a location for interrogating suspects. The UK has, in fact, admitted that the base has been used for extraordinary rendition flights on more than one occasion. Indeed, what the UK does now will reflect not only its commitment to international law and legitimacy-generating institutions such as the ICJ–it will also illustrate to the world its willingness to own up to its colonial legacy and take action to right past wrongs. Chief among these wrongs in this context is the forceful deportation of the thousands of Chagossians that lived on the islands, without any attempt to ensure they had the means to survive once in exile. The vast majority of Chagossians wish to return to their former home, and they have fought a long and convoluted series of legal battles for their right to do so. 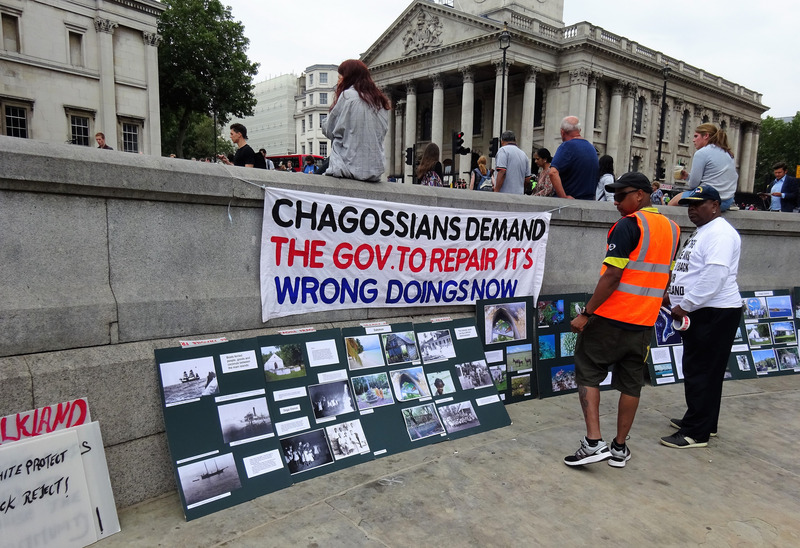 The UK even attempted to establish a marine reserve around the Chagos Islands, seemingly for the purpose of preventing the Chagossians from being able to resettle. It was only in 2017 that the Chagossians finally succeeded in convincing the United Nations General Assembly to turn the case over to the ICJ, setting in motion the process that culminated in last month’s ruling. That the vote passed in the General Assembly seems to have been largely due to a numerous European nations abstaining. Indeed, only 15 states sided with the UK, including, unsurprisingly, the US. This lack of support was mostly likely a result of the UK’s loss of diplomatic influence since the beginning of the Brexit process. After the Chagos Islands vote, British diplomat Lord Hannay unequivocally attributed it to the shadow of Brexit, and even suggested that the same thing might happen again with similar votes, such as votes over the Falkland Islands. In short, this dispute played out in a complex and dynamic political sphere that involved inter-European politics, War on Terror dynamics, decolonization, rule of law, and the efforts of an exiled people to return to their home. The ICJ’s ruling is, without a doubt, a clear victory for the Chagossians, and establishes a significant precedent for the use of the ICJ as an institution for advocating for the right to self-determination in the context of decolonization. This raises interesting questions about the potential reopening and trial of similar cases, for this case will no doubt serve as a symbol of hope for all the peoples in the world who find themselves in the same boat as the Chagossians.